Early Sunday morning Doña Narciza stopped by the PAZA workshop to see if PAZA would buy her granddaughter´s first weaving. 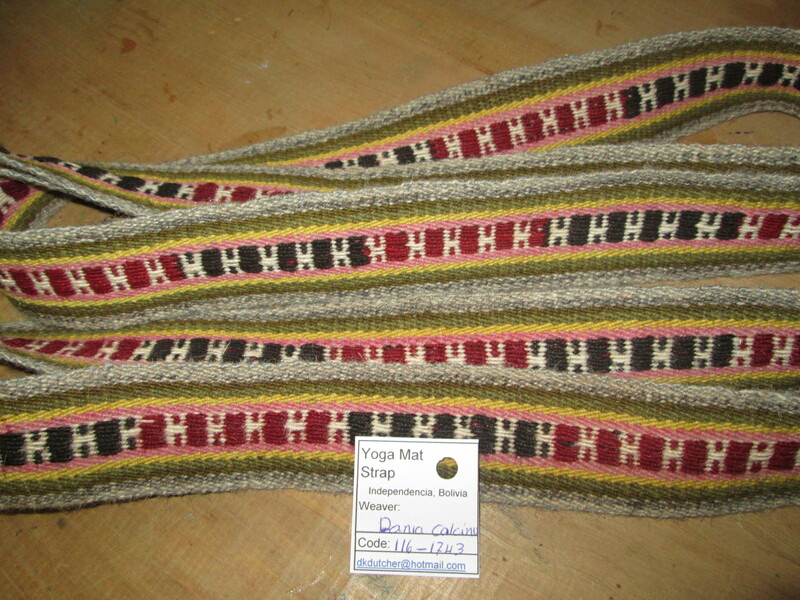 It was woven to the specifications for a yoga mat strap. Doña Narciza has raised her 15 year old granddaughter and told her if she wanted money to spend during the vacation she´d have to work for it. 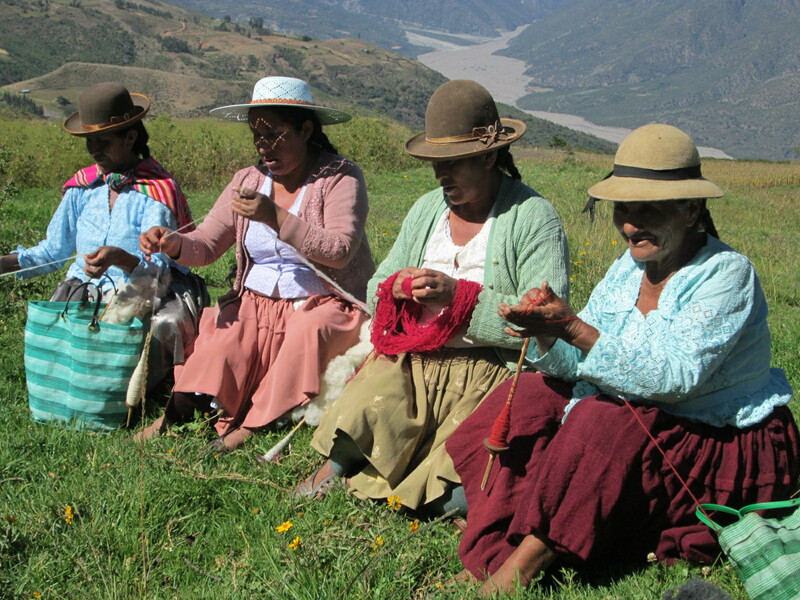 Since there are no businesses or jobs in Huancarani, the sales of crops, livestock, and weavings are the only ways to earn money. Her granddaughter opted to learn how to weave so sat down on a low stool in front of the warped loom, and was instructed on how to weave the “H” figure. After observing a few passes of the weft, Doña Narciza wove a small section while lecturing her granddaughter on quality including a hard beating down of the weft for a tight weave. The granddaughter wove for 3 days. When she finished she threw herself on her bed complaining that she ached everywhere. Doña Narciza had to laugh when she replied, “Now you know”. She´s put in long hours at the loom to finish a weaving for the cash needed to cover school expenses for her granddaughter or her 2 daughters studying in the city. Hopefully, the payment envelope that Doña Narciza carried back to her granddaughter is sufficient encouragement to keep her weaving, and that she will pursue it at a slower pace. 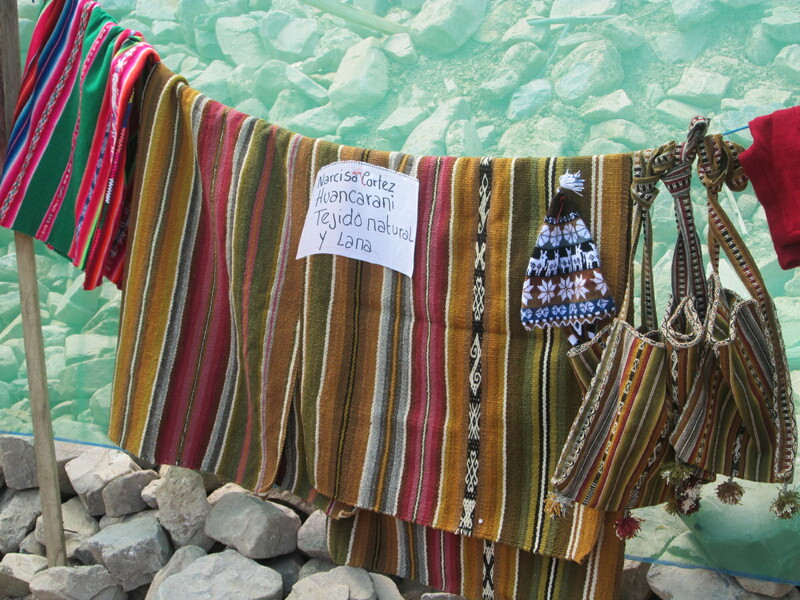 Doña Narciza´s aguayo was filled with weavings to display at the annual Fair of Livestock and Artesanía. She´d woven a blanket with natural dyes as well as half of a second blanket which included a column of figures. 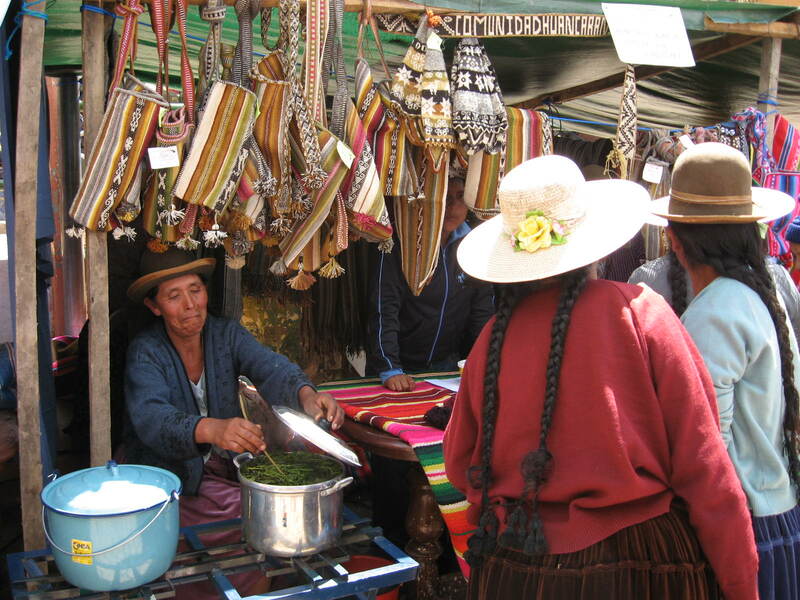 Blankets are usually woven without figures and with local wool dyed with powdered synthetic dyes that run when they´re washed. She had also woven 3 ch´uspas (shoulder bags) for the fair. After 8 years of using natural dyes for the weavings they sell, the weavers are beginning to use them for what they weave for their homes and themselves. Doña Máxima, Vilma, and I headed to the fair at midday. 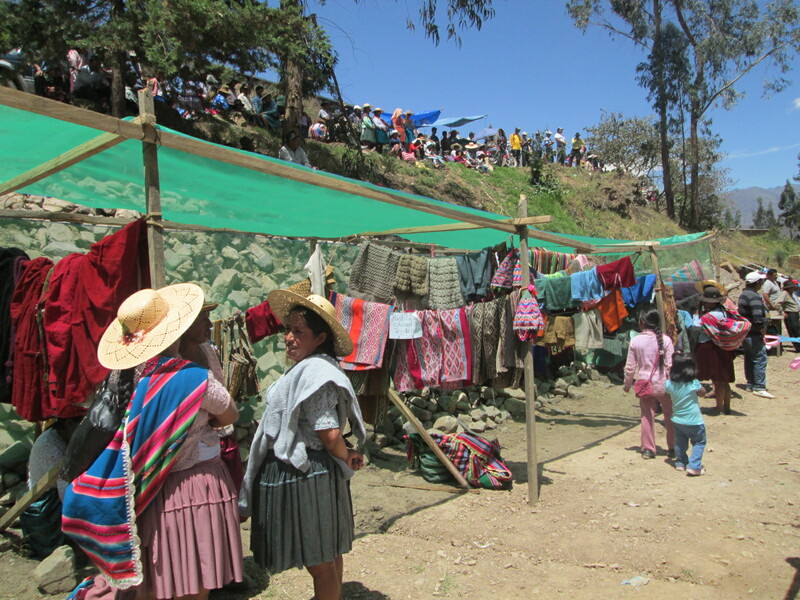 It is sponsored by the municipal government, and a few crude stalls are set up each year for the artesanía displays. 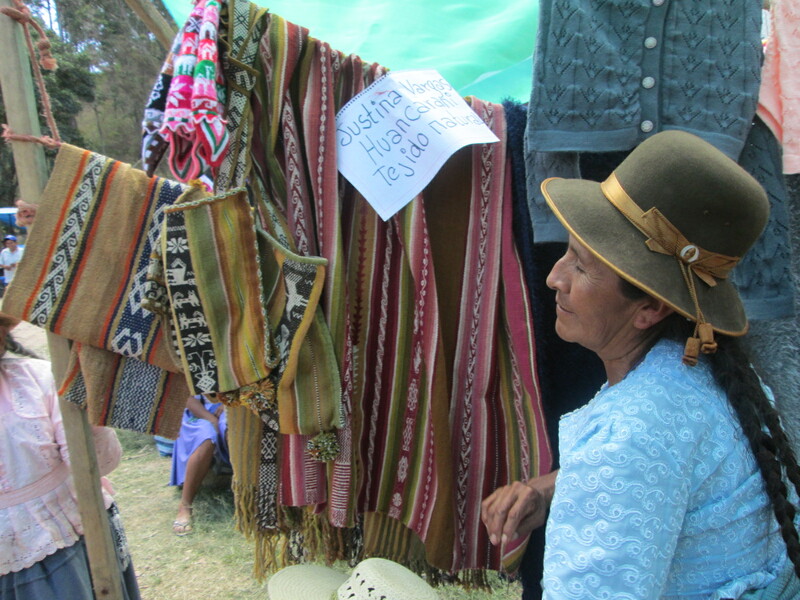 Doña Justina, also from Huancarani, had on display a gorgeous aguayo woven from natural dyed yarn. Doña Dionicia, the eldest of the Huancarani weavers who sells through PAZA, had brought weavings and wool polleras (skirts). She takes her weavings to any fair in the municipality hoping to make a sale. Because the fairs only attract local farmers and all the women weave to some degree the fairs tend to be more of an exposition than a sales opportunity. 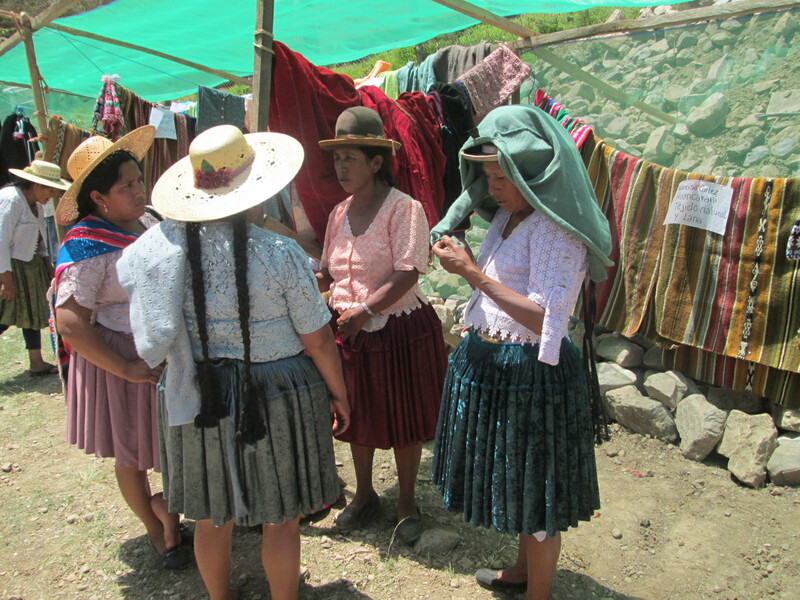 The municipality operates a sewing center in Independencia that has been the Clubhouse for a group of women who have made life difficult for PAZA, Doña Máxima, and the Huancarani weavers since 2010. 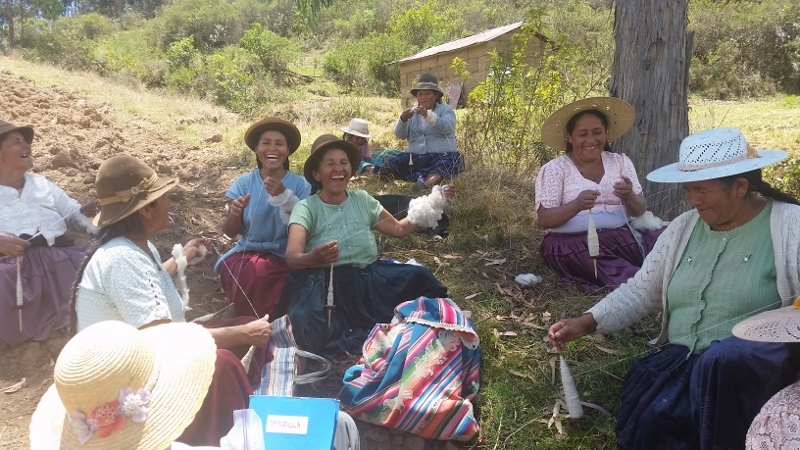 That group is involved with the judging, and last year they gave a prize to a participant who entered unwashed alpaca fiber over Doña Narciza´s ch´uspa with embedded double woven figures. The new mayor can´t change staffing until 2016, so the same group did this year´s judging. They ignored all of the extraordinary Huancarani weavings. Doña Máxima was furious, but it was pointed out that the Huancarani weavers are renowned for their skills at an international level through their participation in Spinzilla. The time is coming when they will be honored in Independencia for their leadership in the local movement to celebrate and preserve their weaving culture. Thanks to a non-profit organization that organized an excellent artisan fair in 2009, the women of Independencia know what the annual Feria de Artesanía could and should be. The fair will be discussed at the annual meeting of the Centro de Artesanía in Huancarani next week. 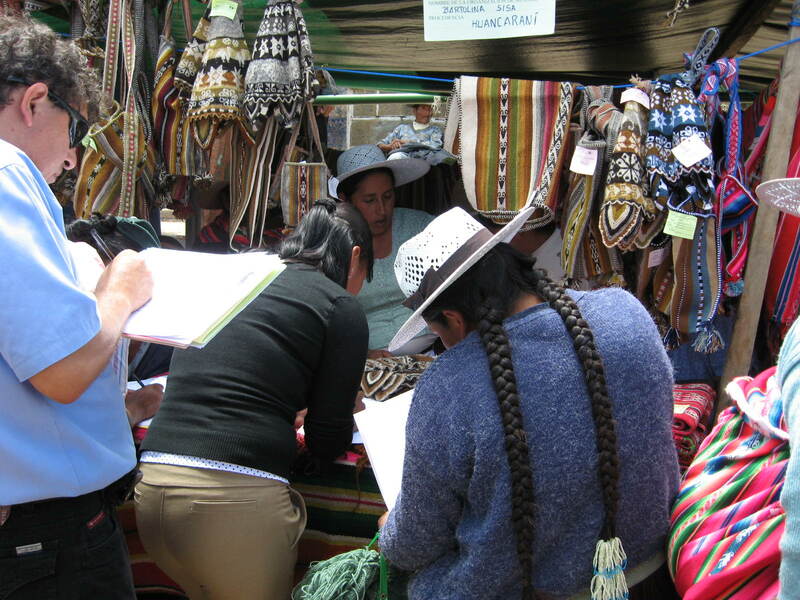 The judging over the past 2 years provides the Huancarani weavers leverage to lobby for change in the use of the municipal artesanía budget and in the organization of the annual fair. Some of our greatest leaps forward, such as beginning the Club de Artesanas, came into being by turning the negative into something positive. Thank you for the continued photos and glimpses into life in your area! I hope you send some ch’uspas to Clothroads next time around, because I’d love to buy one! I will let Marilyn know when she orders this year. Thank you for letting me know. It´s sad the traditional products don´t sell, but hopefully that will change.